The foundation offers guided tours through the different exhibitions of the documentation center. Visitors interested in participating in a tour should sign up at the reception desk 30 minutes before the start of the tour. Please note that for organizational reasons we are unable to accept written or telephone reservations. Guided tours last one hour and can be booked for a maximum of 17 participants. The following languages are available: Arabic, German, English, French, Hebrew, Italian, Polish, Russian, Spanish, Swedish and Turkish. The price per group is 70 € payable in cash or with credit card at the information desk. Guided tours are free of charge for educational institutions if a certificate is presented. This tour focuses on how the personnel of the Nazi terror machine planned, organized and implemented the persecution and murder of millions of people in Germany and throughout Europe – and what this meant for the victims. 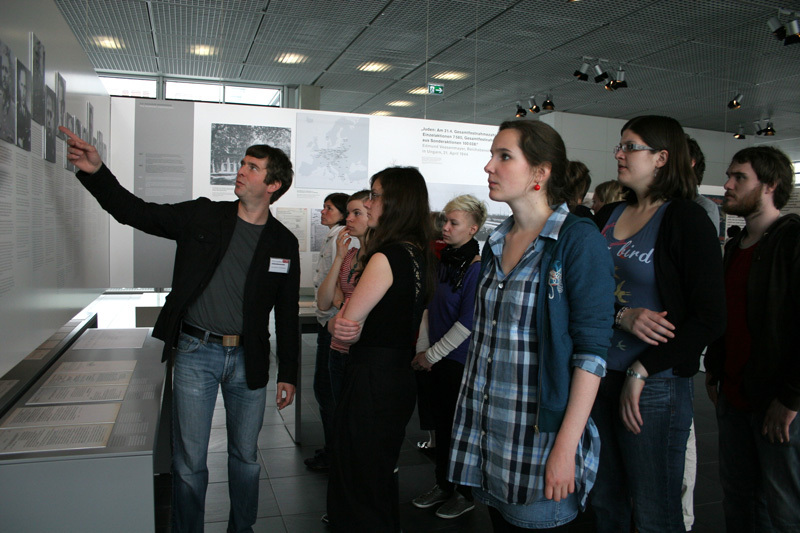 The tour ends with the question of how the perpetrators were dealt with in postwar Germany. This site tour invites you on the track of history on the grounds of the former Nazi „Terror Center." With our expert guides you can get a critical perspective on the Nazi past and the way this "site of the perpetrators" was dealt with after 1945.